Mangaluru, July 3, 2015: Earlier known as ’Orchid Art Gallery’ now - ’Gallerie Orchid,’ The inauguration will be on July 4 at 7 pm. The Gallerie is located at Level II Excel in Mischief Mall (Above BIBA) on K S Rao Road, Mangaluru. Ever since the gallery was born, art awareness and the need to have a work of art has got better. Focusing on a space for promoting art it has logged in 52-curated exhibitions of established and emerging artists. The efforts to reach out to international and national audience, have yielded good results. It takes time to know the pulse of the people regarding art. Though the numbers is still small, it is encouraging said Gallery Proprietor William Pais. 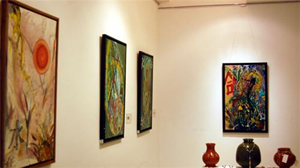 Gallerie Orchid has successfully donned the roles and launched many artists. The buyer on the other hand, was given consultation to chose work of art that would befit his taste and understanding. The cause of art supersedes all profit motives. To be featured in the inaugural exhibition are nationally known masters starting from M F Hussein who spearheaded India’s march into modernism, B Prabha, Philip D’Mello, Anil Bihari, Sashikanth Bane, Nemiraj Shetty, Ramesh Rao and Sudesh Mahan. Promising names like, Jeevan A S, Wislon D’Souza, Anil Devadiga, Devi Prasad Rao, Rajkumar Sthabathi and few other new comers too will be seen.